Okayama Orphanage (岡山孤児院, Okayama Kojiin) in Okayama. 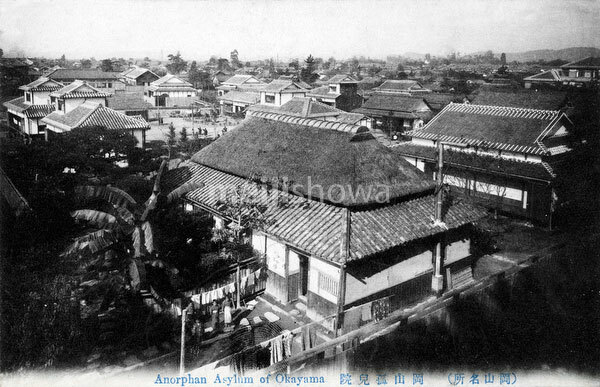 The orphanage was founded by Juji Ishii (石井十次, 1865-1914) in 1887 (Meiji 20) at Sanyuji Temple (三友寺) when Ishii was only 22 years old. It was one of Japan’s first private welfare institutions for children and at its height in 1906 (Meiji 39) cared for 1200 children and employed 200 workers. Ishii, a Christian, saw the orphanage as a way to start a social and religious revolution that would eliminate poverty. During the end of the 19th century, US born Linda Richards, a founder of nursing education in both the US and Japan, worked here.